The transient gravitational-wave signal was produced by the collision of two stellar mass black holes, researchers said. Scientists have made the fourth detection of gravitational waves - ripples in the fabric of space and time - formed by the collision of two massive black holes located about 1.8 billion light-years away. The signal was recorded on 14 August by the Virgo detector located in Italy, and the two Laser Interferometer Gravitational-Wave Observatory (LIGO) detectors located in the US. It is the first joint detection of gravitational waves with the Virgo and LIGO collaborations. The Virgo Detector. Image: The Virgo Collaboration. The transient gravitational-wave signal was produced by the collision of two stellar mass black holes, researchers said. The detected gravitational waves - ripples in space and time - were emitted during the final moments of the merger of two black holes with masses about 31 and 25 times the mass of the Sun and located about 1.8 billion light-years away. The newly produced spinning black hole has about 53 times the mass of our sun, which means that about 3 solar masses were converted into gravitational-wave energy during the merger. Findings from the event, known as GW170814, will be published in the journal Physical Review Letters. With the next observing run planned for 2018 such detections can be expected weekly or even more often, Shoemaker said. "It is wonderful to see a first gravitational-wave signal in our brand new Advanced Virgo detector only two weeks after it officially started taking data," said Jo van den Brand from Vrije Universiteit (VU) Amsterdam in the Netherlands, spokesperson of the Virgo collaboration. 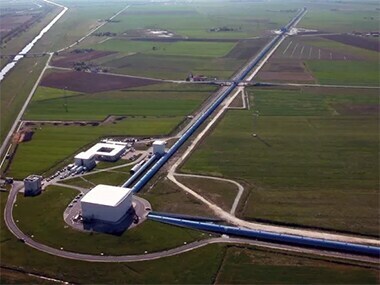 Advanced LIGO is a second-generation gravitational-wave detector consisting of the two identical interferometers in Louisiana and Washington, and uses precision laser interferometry to detect gravitational waves. It detected the first gravitational wave in February last year, almost 100 years after German scientist Albert Einstein predicted the phenomenon. Advanced Virgo is the second-generation instrument built and operated by the Virgo collaboration to search for gravitational waves. With the end of observations with the initial Virgo detector in October 2011, the integration of the Advanced Virgo detector began. The Virgo detector joined the LIGO detectors on August 1 this year. The real-time detection on August 14 was triggered with data from all three LIGO and Virgo instruments. Virgo is, at present, less sensitive than LIGO, but two independent search algorithms based on all the information available from the three detectors demonstrated the evidence of a signal in the Virgo data as well.